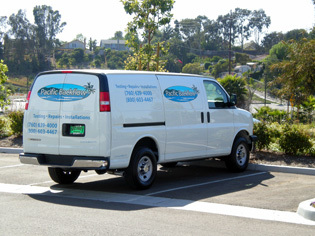 Does Pacific Backflow Company offer emergency backflow service? Yes! We offer After-Hours Emergency Service for backflow preventer problems. 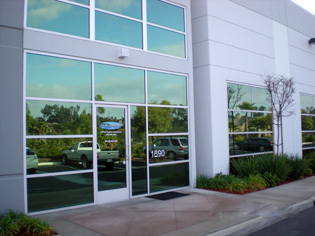 Call 760-822-4325 to reach our on-call technician. Who is required to have a backflow assembly? "Backflow" is the undesired reverse flow of water--and anything mixed in it from any source--into our drinking water pipes. The same community water distribution system that delivers water for us to drink is also cross-connected for use in many other activities, such as: landscape and farm irrigation; manufacturing; climate control; leisure and entertainment; etc. Backflow can happen because water flows from high pressure to low pressure. Water is supposed to flow from the supplier to the user, but because forces of back-pressure and back-siphonage can change the direction of flow, these cross-connections put our drinking water at risk of contamination. For more detailed information on this topic, view our slideshow presentation. 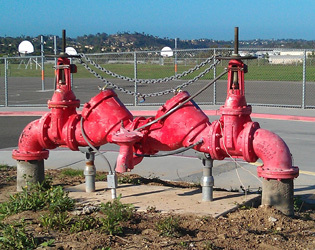 Backflow prevention assemblies protect the public health by standing between the drinking water supply and any potential sources of contamination. Because we make use of water in so many different ways, pollution and contamination can be introduced through plumbing cross-connections. A cross-connection is any pipe or fitting arrangement to a system that carries any substance other than safe, approved drinking water. Backflow protection must be installed on all cross connections, between the drinking water and any sources of contamination. The most broadly effective type of backflow assembly is a Reduced Pressure Principal Backflow Preventer, or "RPP". These assemblies are able to protect against contamination (health hazard) and pollution (non-health hazard), and are effective against both backpressure and back-siphonage. Not all backflow preventers afford this high level of protection. Backflow assemblies are tested annually to confirm they are working properly. Cross-connection control through backflow prevention is required in many applications. Most multi-family housing, as well as all commercial and industrial properties, and irrigation water meters are required to have backflow prevention assemblies. Does my backflow assembly need to be tested? If you have received a backflow test notice from your Water District, you must have the test performed within the specified time period. Even if you don't receive a test notice, it is wise to test each backflow once a year at least. The state of California requires Water Districts to have cross-connection control programs in place. These programs require that certified backflow testers check all backflow assemblies at the time of installation, annually thereafter, and after any repairs. (Testing may be required at other times as well). Backflow assembly testers are private contractors who must submit a report to the water district following a test. What happens if I do not have my backflow tested? There are a couple answers to this question. From a compliance standpoint, it depends on the water supplier serving your property. If for some reason you do not test your backflow assembly you may be cited and/or fined for non-compliance. Also, your water service may be suspended or terminated if the water supplier believes the public water system is at risk. The supplier must ensure the protection of the public water system. At Pacific Backflow, we have processes in place to help our customers avoid these problems and penalties. From a public health standpoint, a faulty backflow preventer can allow pollution or contamination to enter the drinking water supply, putting at risk the health of all who depend on the system. Improper installation and inadequate maintenance of backflow preventers have been documented as causes of public illness. Should I be concerned about backflow in my home? Like in any other plumbing system, water in our homes will tend to flow from high pressure to low pressure. So, yes, the fixtures and connections in a home can allow the backflow of contamination into the household drinking water. Many protections are built in to the home as a result of the Uniform Plumbing Code, but here are some specific areas of concern: Household Water Safety.